...ok I couldnt resist, its a terrible title! This was a office renovation that I did for one of my residential clients for her office in a corporate law firm. 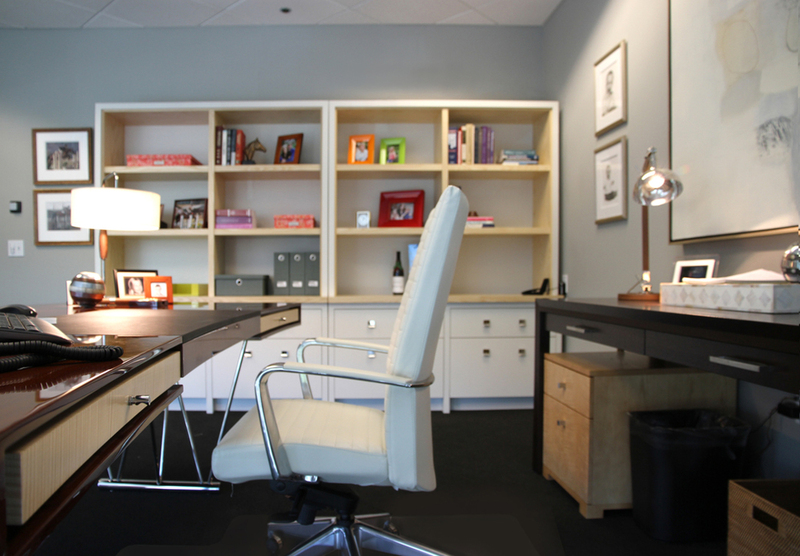 The client was very clear from the beginning that she didn't want "office" furniture i.e. : cheap looking and generic. So I aimed to center the room with a singular stand out piece that was anything but corporate. When my client picked the gorgeous Dakota Jackson - "Maverick Writing Table" the project was made all the more exciting. With a "I may be pretty but you'd better take me seriously" attitude it commands attention and respect - just like my client! (wink) The storage pieces I designed and feature white ash wood details, file drawers and open shelves; these can be made to order with options to change the wood species and paint color - perfect for a home office as well. The other furniture pieces are from Altura and art work is a Dan Jackson from the Dolby Chadwick Gallery in San Francisco. This project was completed in 2011 and we have been so busy that I'm only now getting around to finishing the post I started 6 months ago. The downside to being busy - no time to work on publicity!